Play your cards right = and win the game of 7-Card Stud! Get hands-on poker practice with expert tips on every card for making your bets! 7-Card Stud is hte most popular form of stud poker. Why? With three cards down and four cards exposed at the end of a hand, this game combines surprises from Draw poker with the strategy of four open cards. Plus, knowing when to bet is crucial. This friendly For Dummies guidebook walks you through each stage of the game step by step. 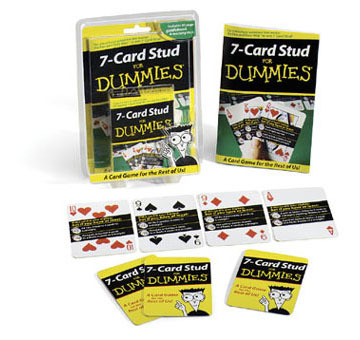 Each card in this specially designed deck gives you helpful hints for impriving your 7-Card Stud skills and strategy. By playing with this deck, you hold the key to 7-Card Stud in your hands.